Solar Water Pumps are an effective alternate solution for the locations where electric power either poor or not available. Solar power to pump sets will also reduce the traditional electric infrastructure like laying electric lines, poles and installing supporting elements & accessories. Huge saving of the losses occurred with the traditional electric lines. Solar Water Pumps are effective, economical to work in remote areas. Automation of Solar water pump sets has become very simple due to penetration of telecom services even to very remote areas. As all the telecom service providers are able to extend Data / GPRS services, cost of providing remote data management has come down drastically. 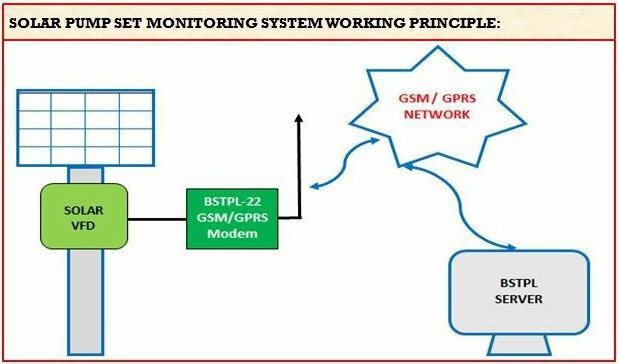 GSM GPRS Modem coupled with a back-end server application provides useful information to users and other authorities which include Geographical location* of the solar pump, date & time of real time data, details of solar system voltage / current / power generated / ON & OFF Timings / Total Water Output ... etc. GSM GPRS Modems use the solar power for its operation thereby avoiding the need of external electricity power. BSTPL Solar Pump Set Monitoring System provides the best view of the functionalities of a remotely installed pump-set. Following are the parameters provided in Live Report. Pump Parameters Like Solar Voltage, Motor Voltage, Motor Current, Solar Power, Frequency, RPM, Water Flow & Current status of the pump i.e. Running or Idle / Ready or Stopped. User can view live status based on the Device ID, PO Number, Consumer Name, State Wise, District Wise, Mandal Wise, Village Wise or Status Wise. User can also search the live report with any of the parameters mentioned here.